Today is the deadline for the Project Yarnway Finale over on Ravelry. The challenge for the finale was to design and produce a five piece collection. There were no restrictions on the design except that the pieces must belong together in some way. We were also instructed to include at least one photograph of all five pieces together and at least one picture of each item alone. If you've been following along, then you know that I chose to design Super Scarves for my collection. 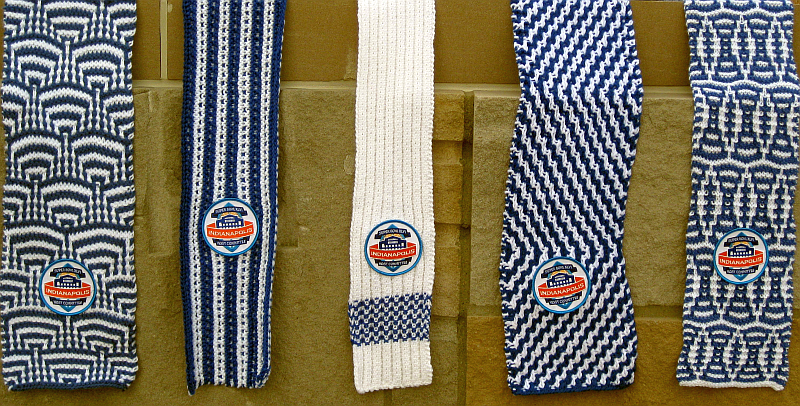 Quick refresher: Super Scarves is the volunteer effort to knit 8,000+ scarves for the volunteers who will staff the 2012 Super Bowl that will be hosted by the City of Indianapolis. The scarves can be knit (or crocheted in any pattern, as long as they incorporate the stipulated blue and white colors in a worsted weight, be at least 6" wide and 72" long. As part of this effort, I've been working with a large number of new knitters through programs hosted by our county library system. I've been inspired by all these folks who are new to the experience of knitting. Preference 1 - all knit - this led to two new mosaic designs that produced a very complex looking scarf, with none of the difficulties of stranded color work (especially when knit flat). Preference 2 - if purling was required, the pattern could only consist of 2 rows, any other rows had to be just knit. Again, I turned to slip stitches - again, an easy way to get two colored, and reversible knitting while knitting with only one color at a time. Now for the yarn bombing. How to display the 5 scarves in a creative way. Here was my solution. 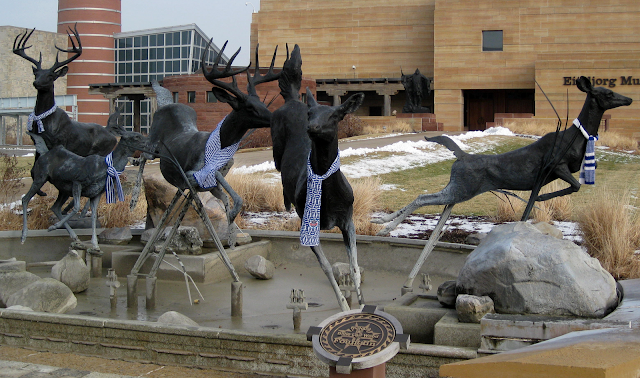 My models are the deer in the fountain in front of the Eiteljorg Museum in downtown Indianapolis, in the shadow of Lucas Oil Stadium, the home of the 2012 Super Bowl. Have to admit it was exhilarating to venture out at the crack of dawn Sunday AM, tip toe around the fountain dressing the deer, grab my shots and then get out of there before anyone beyond a few curious joggers could notice. 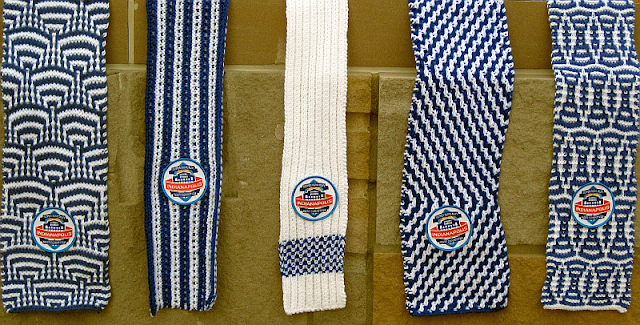 Here's another shot of the five scarves, which have also been adorned with the official patch, ready for donation. Patterns for all of these scarves are available on the right side of the blog under the complimentary pattern section. If you are interested in voting on the Project Yarnway Finale visit Professional Runway and cast your vote in March 2011. There is also an Amateur Runway and a Peanut Gallery. You have to be a member of Ravelry to view - but if you aren't a member already, you should join - it's free and amazing! I have had so much fun and have learned so much participating in Project Yarnway over the past year. The designers who have participated have come up with amazing, innovative and beautiful designs throughout the competition, and I am honored to be able to participate with them all.